Lower expenses - through avoided risks. Increased information security level within the organization. Enhanced knowledge and importance of security-related issues at all level and improve information security controls. Improved visibility into your information security program and better security awareness. Enhancement in clients' and partners' confidence and perception of your organization. Better alignment within your organization. Assists in the development of best information security practice. Our ready-to-use ISMS auditor training presentation guides you to prepare internal auditing. Information Security Management System - ISMS Awareness and Auditor Training Presentation is prepared by a team of highly qualified management professionals. 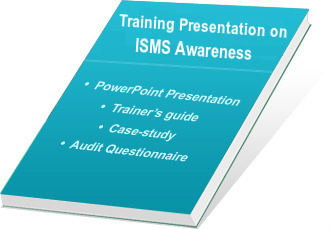 This ISMS training presentation slides are very useful while conducting corporate training within the organisation or any work area. Our many clients globally have already used it to train their employees for ISO 27001 internal auditing and successfully implemented as well as audited information security management system for ISO 27001 certification within their organisations. Topic-wise Information Security Management System auditor training presentation kit contains following modules. Overview of information security management system. Internal audit for information security systems. Methodology, Definition, Risk Assessment, Risk Treatment, Training & Awareness, Audit Preparation, Control and Continual Improvement. Approach Paper for ISMS implementation. Case study-1 & 2 and workshops to take examination of participant after training. Audit Checklist to verify implementation of ISMS. The soft copy of ISMS ppt presentation and handouts are given and one can edit them as per their own requirements. Hand-outs written in MS Word document 2007 and presentations are made in powerpoint. Developed under the guidance of experienced ISMS auditors and consultants. The auditor training kit on ISMS is verified and evaluated at various levels by our team and more than 1000 hours are spent in preparation of this training presentation kit. View free Demo of ISO 27001 Certification - ISMS auditor training presentation kit and purchase it with secure online transaction.